Heat oven to 350°F. Cover baking sheet with parchment paper. Heat oil in a small saute pan over medium heat, add onions and garlic. Cook until translucent. Remove from heat and cool. In a small bowl, whisk together 2 Tablespoons of Jay D's Louisiana Barbecue Sauce, parsley and eggs. In another bowl, add bread crumbs, Parmesan, salt, pepper and meat. Mix well with hands. Add the wet ingredients until just blended. On the sheet tray, form a 12 x 5" log with the meat mixture. In a small bowl, mix the remaining BBQ sauce, brown sugar and tomato paste. Spread over the log. In a zigzag pattern, criss-cross the bacon slices over the top and tuck underneath. Bake until 165°F and bacon is crisp on center rack, approximately 70-75 minutes. Remove from oven and let rest 10 minutes. Cut into 8 slices. For the potatoes, increase oven temperature to 425°F. In a zip-top bag, add the potato slices, oil, salt and pepper. Shake to mix. Transfer to a parchment covered sheet tray. Bake 40 minutes until tender inside and browned on the outside. 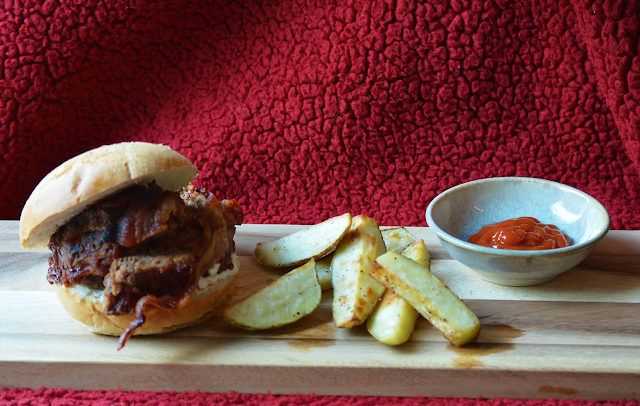 Serve the meatloaf on rolls, spread with the horseradish, sour cream and more Jay D's Louisiana Barbecue Sauce, of course!